The term lead generation campaign means something completely different to a business looking to generate their own sales leads or a business generating leads for a client vs a business generating leads for multiple clients. The difference in who the lead is for changes everything about the campaign from the branding to the execution to the delivery of the lead. So what type of lead generation campaigns are you running and which type of campaigns should you be running? 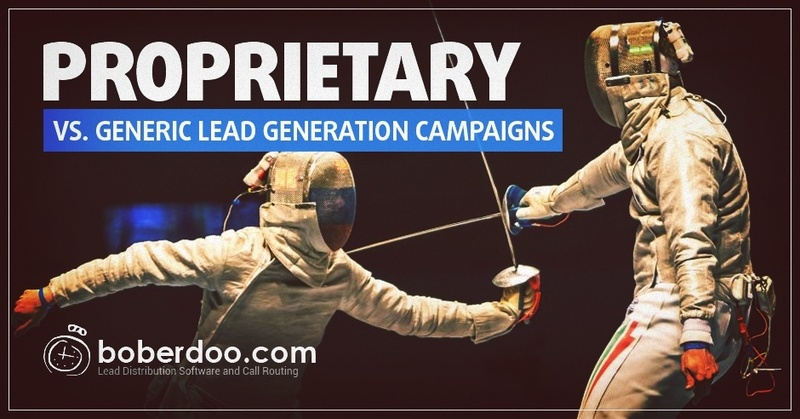 What’s Are Proprietary Lead Generation Campaigns? A proprietary lead generation campaign is run for one specific company. Company A hires you to generate leads for them, which allows you to customize your campaign to their brand and specifications. Customized Campaigns: Proprietary campaigns give you the flexibility to build campaigns catered to your specific client’s needs. Branding Benefits: You can also take advantage of any brand equity your client already has. Let’s be honest, it’s easier to generate driver leads for Uber than for Mike’s car service. No Network of Buyers: Working for a single company still requires you to find that one company to generate leads for, but it doesn’t require you to build an entire network of buyers. Growth Ceiling: Your success will always be dependent on the success of your client. If they’re doing well and can buy more leads, that’s great. If their lead demand drops, so do your profits. Higher Risk: What happens if you lose your client? Even if you have multiple clients, what happens if you lose your biggest? Your entire lead company hinges on the unpredictable nature of lead buyers. Campaign Management Time: Lead generation campaigns aren't easy to build or manage. When building them for a single client, your return will only ever be from that one client, not from multiple for the same campaign build. Volume Balancing: You’re great at generating leads, right? So what happens when your lead generation campaign is so successful that your buyer can’t keep up with your incoming leads? Nothing. Those leads don’t get used and you don’t make money on them. A generic lead generation campaign is a single campaign that generates leads for multiple clients. Because of this, the campaign needs to be generically branded so a lead that is generated can be sold to Company A, Company B or both. Your Brand: By running generic campaigns, you can build your own brand. It’s like renting vs owning a home. Would you rather pay monthly rent with no future return or pay a monthly mortgage on something you will eventually own? Total Control: Generic lead generation campaigns give you the control. Operate in any lead verticals you’d like. Run the types of campaigns that you want. Build your business exactly how you want to. Sky's the Limit: The amount of money you can make is still restricted to how many leads you can sell, but if you’re selling generic leads, you have a massive pool of potential buyers and an infinite amount of industries to operate in making it virtually impossible to ‘hit a ceiling’. No Leads Unsold: With proprietary campaigns, any unsold or unused leads go to waste. You shouldn’t be punished for generating too many leads! Because generic campaign produce generic leads that don't expect to be contacted by one specific service provider, your excess leads can always be sold. Even if you don't have an available retail buyer, selling excess leads to wholesale buyers is a great way to make sure no leads slip through the cracks. Hedge Your Bets: Did you lose one of your lead buyers? No problem. Because generic leads can be sold to virtually any buyers, you can always ensure you have other buyers waiting in the wings to pick up the slack. What’s better than knowing that even if you lose a big buyer, you can easily keep profits consistent and your lead business running without having to scramble for a new proprietary campaign to run? Network of Buyers: Finding buyers and sellers is the name of the game in generic lead generation. It’s not always easy to find the right partners, but there are convenient ways to get started. At boberdoo, we’re certainly biased when it comes to proprietary vs generic lead generation campaigns, but for good reason. Lead companies that focus on generic leads have a much higher earning potential and a much safer business model. That’s why the top online marketers opt for the generic lead generation model. And because these companies have so much sustained success, we have been able to build our entire company around providing them with the technology to help their businesses run. If you’re interested in the system that has been helping lead generation companies automate and optimize their businesses since 2001, please give us a call at 800-776-5646 or fill out the form below.